Snag a bottle of rum, for $4,899! Win the lotto? Feeling rich? You are rich? 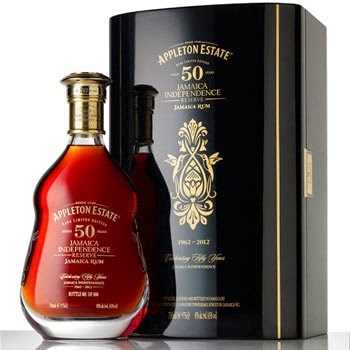 "In 1962, as Jamaica approached full independence, several hand-selected barrels of rum were set aside to age with the intention of creating a special blend that would one day be bottled to celebrate the 50th anniversary of the country’s independence. Matured for a minimum of 50 full years, these rums were at rest carefully aging and being looked after, first by Master Blender Owen Tulloch, then by his protégé and Appleton Estate’s current Master Blender, Joy Spence.As the decades passed, the rum developed a beautifully dark mahogany color with smooth flavors and delightfully complex aromas, due to the natural amalgamation of the rum and oak barrels over time. Master Blender Joy Spence carefully examined each barrel during this period to ensure that it had attained the perfect level of complexity; offering smooth and rich notes that would be fitting to celebrate the 50th Anniversary of Jamaican Independence. Now, over 50 years later, Joy Spence jubilantly confirmed that these irreplaceable barrels of rum had aged to perfection, ultimately creating the world’s oldest barrel aged rum." Of the original casks—ex-Bourbon barrels, which had been shipped as staves to Jamaica and reassembled by coopers at Appleton Estate—only 13 made it through the process due to inevitable evaporation in the strong Caribbean heat. From that, 800 bottles were filled, which will sell for $5,000 each. Yikes. Pick up yours today at: www.acespirits.com/rum. Just save me a shot please.